... and maybe the last! A Crazy cult plans to destroy the world - not just a school or the boring grown-up shops at the mall, but the WHOLE WORLD - and it's up to you to stop them. Now you and your friends, and your horrible friendly monsters, are taking on the Cult of the Ur-Monster from one end of the United States to the other. You'll explore creepy amusement parks, dusty tourist traps and quaint roadside farms in the throes of revolution. Also, the Land of Oz. 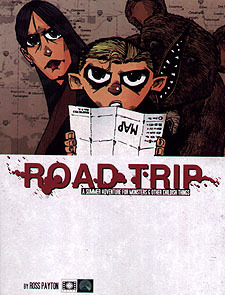 ROAD TRIP is a full-length adventure campaign for the roleplaying game Monsters and other Childish Things, with nine complete adventures, ideas for plenty of extra weirdness the players might encounter on the way, and six full-colour, full-size postcards from some of the strangest places in America. Gas up the van, put ice in the cooler, and don't forget the trail mix. It's time to hit the road.